Bzzz, bzzz, bzzz, SLAP! If you love camping during the warmer months, you’re surely familiar with the sounds of flies and the constant battle to keep them away. Few things can be as maddening on a camping trip as a swarm of flies. Depending on the species, they can have painful bites, contaminate your food, and make an incessant buzzing noise that will drive you and your fellow campers nuts. Avoiding and eliminating those flies is a chief concern for many campers. That question seems like it should be self-explanatory – they’re incredibly annoying and no one enjoys having something buzzing around in their tent at night. Worse though, flies can carry diseases that can not only ruin your trip but leave you with unpleasant symptoms after you get back to civilization. Flies feed on and congregate around animal (and human) waste. That waste gets into their digestive tract and all over their body, making them an ideal carrier for disease. Flies will land on food that has been left out, transferring all of the bacteria present on their body to it. If the food is consumed raw, that bacteria will end up in your body. Typhoid, cholera, polio, dysentery and pink-eye can all be carried by a common housefly. Fortunately, most of these diseases are not prevalent in developed countries, but it goes to show how dangerous the seemingly innocuous creature can be. Biting species like the Deer and Horse fly can carry bloodborne illnesses like lyme disease, the effects of which last for years. If you live anywhere in the Northeast between Ohio and Maine, you’re probably already aware of the phenomenon known as Black Fly Season. Depending on the climate in your state, it runs for a month or so sometime between mid-March and mid-June. Those pesky critters make camping during the spring season unbearable, so most hikers just choose to stay out of the woods for a month. Ask a ranger in your district when the flies are out in mass and they’ll probably tell you some dates to plan around. Recognizing that it’s just not the right time of year for camping is a while lot easier than trying to mitigate the nuisance once you’re there. While species of the Deer and Horse Fly prefer to dine on your flesh and blood, most flies are just interested in the leftovers we leave behind after an evening meal. It’s always smart to wash your camp dishes as soon as you’re done eating. This not only prevents flies from forming a cloud over your food table, but it will lessen the risk of a bear wandering in to your site looking for a buffet. Seal up any packages of food and place them in an airtight cooler, if you can, and never leave food inside your tent. DEET insect repellant isn’t just effective against mosquitos, it also keeps flies at bay. The chemical confuses their sense organs and prevents them from finding their food source (you). If you’re uncomfortable using DEET on your skin and clothing, you can make your own repellant with essential oils like citronella and peppermint. It’s not quite as effective as DEET, but it’s better than going without repellant. This might seem counter intuitive, but one of the best ways to eliminate flies from your campsite is to bait them in. Fly paper and commercial traps use sweet smelling attractants to draw in the flies and then prevent them from getting away. While it might be a little unseeingly to have containers of dead flies around your campsite, at least they’re not buzzing in your ear. You can create a DIY fly trap by cutting a 2 liter soda bottle in half, filling the bottom section with vinegar or a sugary liquid, and then turning the top section upside down inside of it. Flies will go down the nozzle, but it’s almost impossible for them to get back out. This is by no means the most efficient way to eliminate the flies at your campsite, but it might be one of the more entertaining ones. A few companies make devices that look like a tennis racquet, but have a bug-zapping metallic mesh across their interior. Just hold down the zapping button and start swinging it in the direction of flies. A satisfying pop will let you know when you’ve eliminated one (or ten) of them. Sometimes there’s nothing you can do to fight the flies and your best option is to just run away from them. You can set up a “screen house” – a tall canopy made out of mosquito netting that a few people can sit underneath. It will feel like you’re separating yourself from the wilderness, but sometimes those flies are just too much to deal with. Every species of fly has a preferred habitat – biting flies seem to like bright, open areas where they can easily see their prey. Most non-biting flies enjoy the shade where they can find damp, rotting food to feed upon. Carefully consider your tent placement, cooking area, and fire pit location and then think about where the flies will be at different times of day. Annoying as they may be, you do have to remember that flies are a part of nature and any excursion into the forest is probably going to involve at least a few of them. 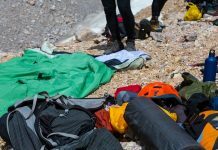 They are a nuisance, and it’s great if you take some precautions to limit how many you have to deal with, but don’t let their buzzing prevent you from enjoying your campsite. Some flies do carry disease, but the risk of contracted one from them is smaller than with other biting critters like ticks. If one bites you, wash the area with soap and water, and move on with your day. The sun is still shining and a day of camping with flies is still better than one spent at the office.